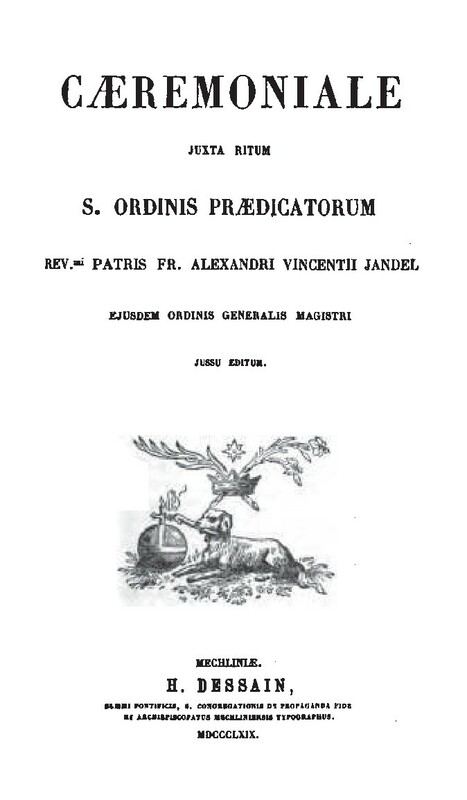 I am pleased to announce that Dominican Liturgy Publications is now able to make available a paperback reprint of the Caeremoniale juxta Ritum S. Ordinis Praedicatorum, published by order of Fr. Alexandre Vincent Jandel, O.P., Master General of the Dominican Order, in 1869. 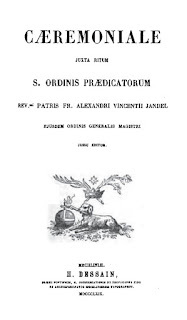 It was the last ceremonial published for the Dominican Rite. It is reprinted in a convenient pocketbook-size format. When celebrating the Dominican Rite, this volume should be used in conjunction with the revised rubrics of the Breviary and Missal of 1962. This older book gives detailed instructions for many processions and other ceremonies in addition to those of the Mass and Office. It also supplies instructions that are lacking in more modern books. The volume is also useful for historical studies, as it includes abrogated medieval rubrics, along with the legislation that changed them; for example, use of yellow vestments for Confessors, something dropped even before the Council of Trent. Purchasers should note that is a photographic reprint from scans of the original printing, which is itself a bit muddy. We have tried to clean up these scans as much as possible, but they are still imperfect, and the “gutter” is a bit tight. Therefore, purchasers should carefully check the preview to see if the quality is sufficient for their needs. Readers may find this book and our other publications here.